Astronomy is a devourer of light. For humans the distant cosmos is a tapestry of the most delicate and fleeting textures. Scant photons that left their sources billions of years ago are only now driving down through Earth's atmosphere and onto its surface. In our more local neck of the galactic woods are objects that are intrinsically dim and transitory in nature, whether planets or asteroids, or things going bump in the astrophysical night. To see and understand all of these phenomena we need to capture as much of their electromagnetic signaling as possible - the photons emitted, reflected, and scattered from the universe around us. That means building big light buckets. The added advantage is also that the bigger the instrument the finer the details of the images it can make. Over the course of the next decade or so we're going to see the creation of a new generation of super-sized telescopes here on Earth's surface. Despite the challenges of peering through our atmosphere and dealing with weather and human light pollution, the simple fact is that for now it's here on terra firma where we can build our best light gatherers. 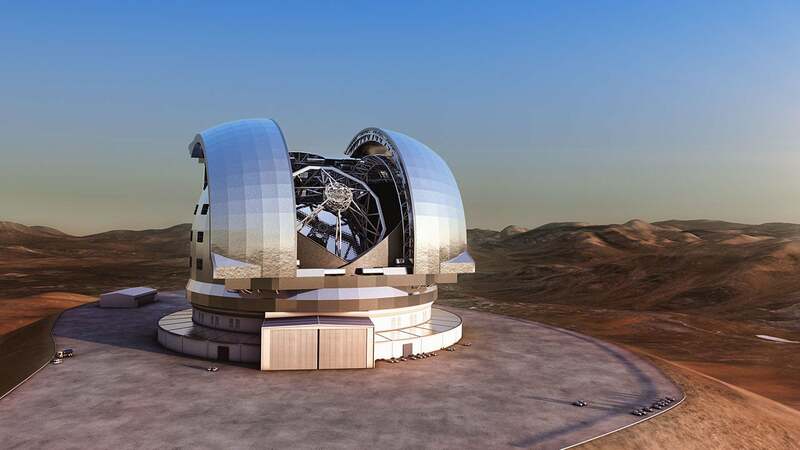 One of these new observatories is the European Southern Observatory's rather simply named Extremely Large Telescope, or ELT. This will, by about 2024, consist of a primary collector nearly a staggering 40 meters in diameter, composed of 798 smaller 1.4 meter diameter mirrors. Gathering about 256 times more light than the Hubble Space Telescope the enormous girth will also enable - in principle - an image resolution about 16 times better than Hubble. Early construction has begun, and we can see for the first time the colossal footprint of the ELT in the image below. A web of concrete and rock now forms the foundations for the observatory dome (a structure about 86 meters across) and other telescope facilities. 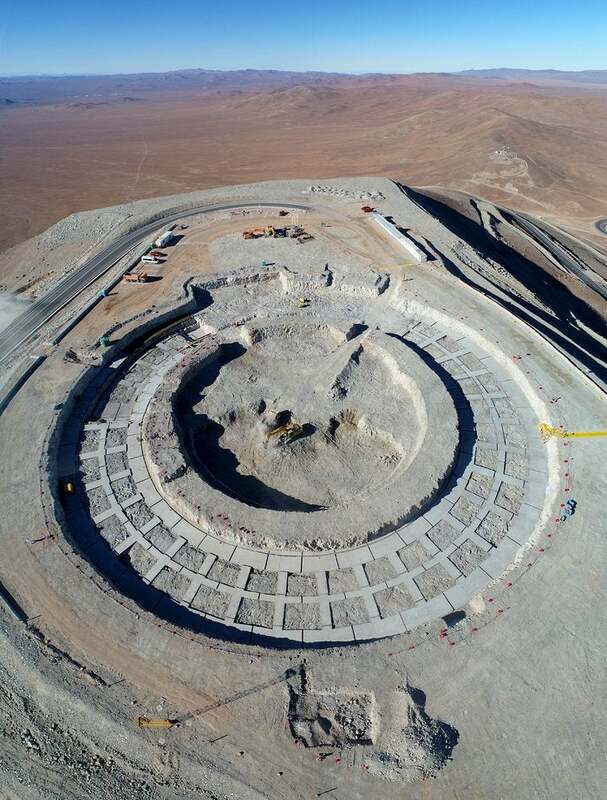 This is the construction as of October 2018, on top of Cerro Amazones in Chile - whose peak has been lowered by about 18 meters to make the underlying base. The scale is already a little hard to take in, but towards the upper left of the image you can see some large trucks that give a sense of the span of the structure so far. Eventually it will look something like the following artist's impression (here little parked cars are shown for scale).